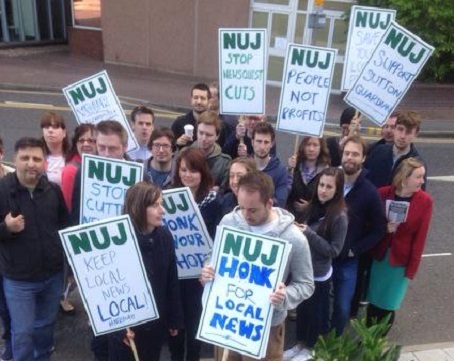 A group of weekly journalists has voted to strike just days after most of their newsroom was put at risk of redundancy. Members of the National Union of Journalists at Newsquest South London backed the proposed action, as well as industrial action short of a strike, following a three-week ballot. The move comes after the NUJ claimed on Thursday that 11 editorial roles were set to be cut across the group’s 29-strong newsroom, although the ballot began before the announcement was made. A total of 71.4pc of staff voted for strike action, while 81pc backed action short of a strike. Journalists were balloted over inadequate staffing levels, excessive workloads, reduced quality of newspapers, the health and safety of employees, and pay rates. A Newsquest South London NUJ chapel spokesman said: “This ballot result shows members are more than up for the fight to not only save jobs, but to boost investment in our newsroom. If the company expects to implement these cuts with little resistance it’s in for a nasty surprise. Last week HTFP also reported that the South London titles would no longer have professional photography coverage after Newsquest ended a decade-long agreement with the Deadlinepix agency. A spokesman for Newsquest said: “We are disappointed that the union members have taken this stance. We remain fully committed to our free newspaper portfolio in South London, but it needs to have a cost base that is sustainable. Everything that needs to be said about this sorry affair has been said. M.D. and senior management at South London cocked a deaf-un. Actions will now speak louder than words.